Blog What Are Dental Implants? Many people have heard about a dental implant. Most of us probably know somebody with an implant, but what are dental implants? Do they hurt? These are common things to wonder. In today’s blog post we are going to answer all your questions about dental implants and how they are used. If we miss something here feel free to ask us your question in the comments section or give us a call at 423-899-1112. We would love to answer your questions about dental implants. What exactly is a dental implant? A restorative or cosmetic dental implant is a surgical component that interfaces with the bone of the jaw or skull to support a dental prosthesis such as a crown, bridge, denture. 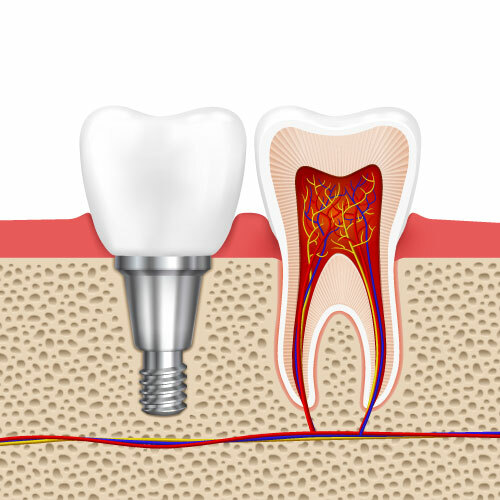 A dental implant is a small screw looking device made of titanium. They have a surface that attracts bone to attach to them. The basis for modern dental implants is the biologic process called osseointegration, this is where the dental implant fuses to the bone. The implant fixture is first placed, so that it is likely to osseointegrate, then a dental prosthetic is added. A variable amount of healing time is required for osseointegration before either the dental prosthetic (a tooth, bridge or denture) is attached to the implant or an abutment is placed which will hold a dental prosthetic. Dental implants success depends of many factors. At McOmie Family Dentistry we place many many dental implants each year. We have placed over a 1000 of them, our success rate is above 98% success. Many factors have to be taken in to consideration for how successful an implant will be. Smoking: This will affect the implant’s success. If you are a heavy smoker then your success rate at properly osteointegrating an implant will be slower and the success rate drops down by at least 10%. In fact many professionals refuse to do implants on smokers entirely. At McOmie Family Dentistry we take this as a case by case basis. Overall health: The healthier the person the higher the success rate of an implant. Diabetes: People with poorly controlled diabetes will have a lower success rate as compared to the non diabetic population. This doesn’t mean they can’t have an implant just that it may need more healing time. Quality of the bone: Bone is different in different locations of our jaws. The quality of the bone in our lower jaw in the front is really good. The bone in the back of our upper jaw is typically softer and will require more healing time. Implants act as platforms for which we can do many things. We can replace a single tooth with an implant. This is probably the single biggest use of dental implants. Often times Dr. McOmie will take out a failed tooth and at the same time put in a dental implant. This is called immediate placement. It was originally thought that an implant had to be left alone for a certain period of time before restoring it. But now we know stability is the most important. If the implant is stable and gets a torque of 35 Ncm then it can be restored immediately. We like to let the gingiva heal around it and then get to restoring it. Dental implants can be used for stabilization of a removable prosthesis as well. A removable prosthesis is usually referring to a denture or a partial denture. A special attachment can be screwed on to an implant and the other side of the attachment is placed in the denture. These two parts are made to SNAP together. This changes the wearers life often times. Often times in one day they go from a loose miserable denture to one that snaps in firmly. A whole mouth can be restored with dental implants and return the user to a more natural state of teeth. Dr. McOmie can on as little as 4 implants make an entire arch of teeth that will screw on to the implants! These stay in the mouth all of the time and are cared for like natural teeth! A bridge done on implants only can be a great way to get teeth back. Two implants holding 3 or more teeth is common in the modern practice of dentistry today. McOmie Family Dentistry does this with dental implants all the time it is actually common place. Dental implants are fantastic they are life changing, they are a routine part of the dentistry we do today. They are not experimental or weird at all. They are mainstream and used by millions of people successfully! If you think you or a member of your family could benefit from implants give us a call today. You can come in for a free consultation and find out what a dental implants can do for you! Give us a call today McOmie Family Dentistry 423-899-1112 ! We love our patients!